This style of t-molding by Mannington is a transition strip that connects 5/16" or 1/4" thickness of flooring over a maximum 1 1/2" span. 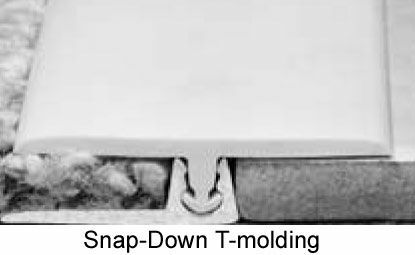 The snap down t-molding transition strip can be used with a variety of flooring. The rubber t-molding will stand up to high traffic and provides a snug connection between the two types of flooring. 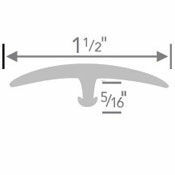 The t-molding transition strip has a smooth, non-slip surface and meets the corresponding American Disability Act (ADA) requirements. The transition strip is easy to maintain, just clean with mild soap and water. Mannington t-molding transition strips come in 7 popular colors. 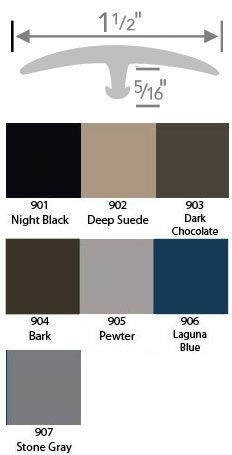 Scroll to the bottom of the page to see samples of available colors. Actual color shades of may vary due to monitor settings. Transition strips come in 12' lengths and can be shipped to your home, office, or worksite. Due to length, the 12' section is shipped coiled. Once received, uncoil and lay flat. The transition strip requires the use of a track base. Please remember to order this so you can finish your project.